All-Stars for Sure | Are You Zhazha? They are little boys. Most of them are 7 years old. They like to pack their mouths with bubble gum and run through the mud. They make up nicknames for each other and knock hats off heads. They wear their sports drink mustaches and red dirt-coated skin with pride. They are a baseball team. These past few weeks of summer break for Nate have been filled (happily) with baseball. 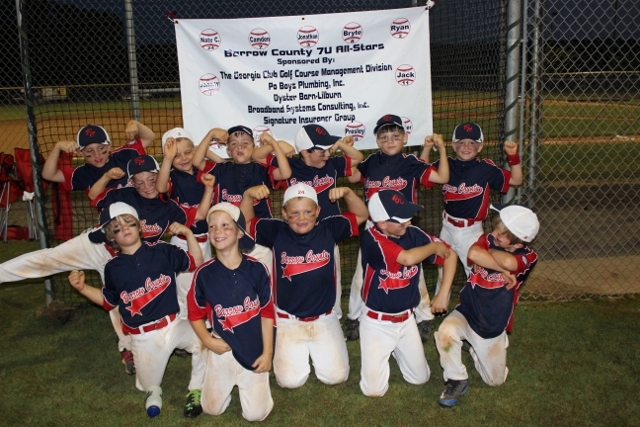 The Barrow County 7U All-Stars have been practicing so hard and all that teamwork paid off for them during the Dizzy Dean Regional Tournament. They won three games and placed third and are now on their way to the State Tournament. Watching them out there was something to see. They are little boys but they have so much courage, heart and skill that I find myself forgetting how little they are. Little boys, right? But then there is so much more to these young players. When an injured player was down on the dirt, they ran to that player and took a knee to make sure he was ok. They’ve been playing each game for a teammate who had to miss the tournament for health reasons – shouting his name after each team huddle. (We are so happy to know he is feeling better now.) They cheered each other on so adorably during the games – one even decided one thumbs-up wasn’t good enough so he dropped his glove and gave his teammate double thumbs for a great catch. They make split second actions through all the voices cheering for them or the other team. They carry on when that action didn’t pay off or the play didn’t work out like they imagined in their head. (The next play rocked, by the way.) They looked the other team’s players up and down to size them up. Sometimes, I saw them talking to each other at the base. Chatting about tv shows they like? Right. Shaking it off. Feeling the joy. Dealing with the heartache of a hard-fought loss. Staying a team. Sliding at Home after “good game” high fives were exchanged. Taking the W or L and thinking about how they can’t wait to play the next game. These little boys have taught me so much. I got a little teary eyed…and we all know there is NO crying in baseball!